Find all information regarding this object on the website of Stoit Groep: On the 29th floor of the ' Admirant' residential tower you can enjoy the fantastic view over the center of Eindhoven and the beautiful green surroundings. When you enter this apartment you will be amazed by the beautiful light. This house is fully equipped with a cast floor with underfloor heating. A parking space is also available in the underground car park. The parking garage is located on -1 and -2. There is also a shared bicycle shed at -1 and there is an extra storage space at -2. Mailboxes and doorbells, equipped with videophone. Double lift and the stairwell. Also here is the workspace of the caretaker. 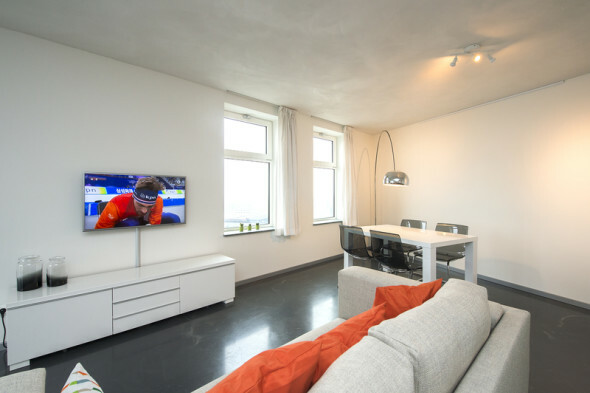 Living room with beautiful windows with a fantastic view over Eindhoven. In the large living room, the ceiling heights have been handled playfully by placing a large void. This has created even more space. The apartment is fully and very luxuriously furnished. The new kitchen is equipped with luxurious appliances, such as a dishwasher, a combi oven, an induction hob and a beautiful stainless steel exhaust chimney. The bathroom is accessible through both the bedroom and the hall and is equipped with a double sink, a bathtub and a separate shower cabin. The separate toilet is in the same style as the bathroom. There are two storage rooms in the hall. The larger storage room is equipped with washer / dryer and ample storage space. The smaller storage room is equipped with an American fridge.